Thailand is experiencing a rainy season (monsoon) from May to October and the months of March and April can be especially hot (regularly above 40 degrees). The thai climate is hot and humid. So the best time to get there is from November to March. Note that in November, the South and particularly the area of Koh Samui, Koh Phangan and Koh Tao is still very rainy. But you can also visit Thailand during the rainy season, you just have to adjust your program and go there knowing that there will be heavy rains from time to time. This is not really about weather but linked to it, note that in the upper North of the country, there is every year, usually from late February to mid-April, episodes of ''smog'', a fine particles pollution due to deforestation fires. The air quality regularly hits unhealthy levels and wearing a N95 mask recommended. There are smartphone apps like Air Visual or websites that gives the Air Quality Index (AQI). Personally, on these dates, I use them more than weather forecast apps. The peak tourist season in Thailand is between mid-December and mid-January. It is the most expensive period, many hotels and guesthouses in southern Thailand offer higher rates during high season. You can sometimes pay 2 times more for a room if you take it during dry or during rainy season. The highest prices are are around Christmas and New Year. During dry season temperatures range from 28 to 38 degrees. 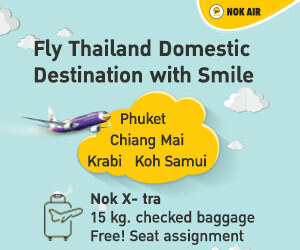 But you can also come to Thailand during the monsoon and enjoy your trip. Prices are very advantageous, the rains are sudden and abundant but between two rain showers you can enjoy your stay in Thailand. However, streets can be flooded sometimes. We give you this information for guidance, they show the trends but weather is increasingly unpredictable so it for a period or another, they may be contradicted by the real weather in Thailand.